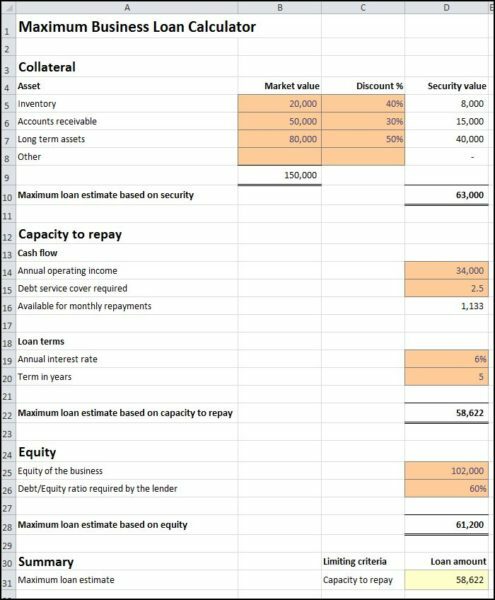 This maximum business loan calculator can be used when preparing financial projections for a business plan to estimate the maximum amount a lender is willing to lend based on three lending criteria, collateral available, the capacity of the business to make repayments, and the owners equity in the business. Our article on the five C’s of credit gives further details of how a potential lender will view and assess the business. Enter the market value of each asset to be used as collateral. Enter the discount percentage applied by the lender to each asset. The lender will apply a discount percentage to each security offered, and the total discounted value must be at least equal to the amount of the loan. For example, if the market value of the assets is 150,000, and the discount percentage applied by the lender is 40%, then the security value of the collateral and therefore the maximum loan is only 150,000 x 40% = 60,000. Enter the annual operating income of the business before depreciation. This is the income the business has available to make repayments on the loan. Depreciation should be added back in arriving at this figure as it is a non-cash item. Enter the debt service cover required by the lender. In theory, the operating income is an estimate of the amount of cash available to make loan repayments. The lender however, will want a certain amount of cover to ensure that adequate cash is available. For example, if the annual operating income is 36,000 and the required debt service cover is 2.5, then the amount available for loan repayments as far as the lender is concerned is 36,000/ 2.5 = 14,400 or 1,200 a month. Enter the annual interest rate and the term of the loan in years. The business loan calculator works out the maximum loan which could be supported by the cash available for monthly repayments. Enter the equity of the business. The equity is the amount invested by the owners of the business as capital together with any earnings retained within the business. In the financial projections template it can be found towards the bottom of the balance sheet under the heading ‘Total Equity’. Enter the debt/equity ratio required by the lender. A lender will have a maximum allowed debt/equity ratio which it will use in it’s calculations. For example, if the equity of the business is 102,000 and the maximum debt/equity ratio allowed by the lender is 60%, then the maximum loan allowed by the lender is 102,000 x 60% = 61,200. 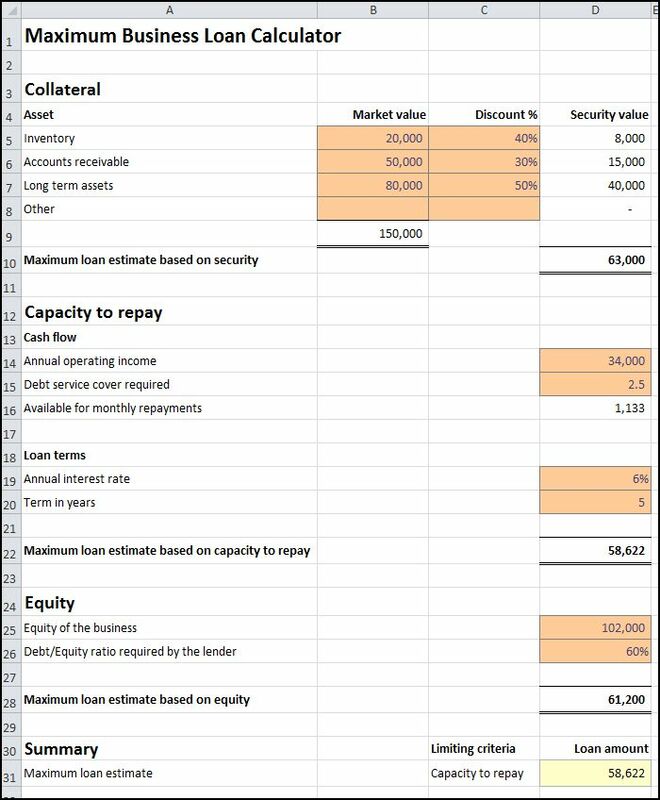 In the summary section, the maximum business loan calculator shows which of the three criteria (collateral, capacity, equity) is the limiting criteria for estimating the maximum loan available to the business, together with the value of the estimated maximum loan. Obviously the bank will take into consideration many other factors, such as the credit history of the business, in deciding whether or not to lend, and what the maximum amount to be made available should be. However, the maximum business loan calculator provides a simple guide as to what loans might be included when preparing financial projections. The maximum business loan calculator is available for download in Excel format by following the link below. Users use this maximum business loan calculator at their own risk. We make no warranty or representation as to its accuracy and we are covered by the terms of our legal disclaimer, which you are deemed to have read. This is maximum business loan calculator template that you might use when preparing financial projections in Excel. It is purely illustrative of a small business loan calculator. This is not intended to reflect general standards or targets for any particular company or sector. If you do spot a mistake in the maximum business loan calculator, please let us know and we will try to fix it.